Why do we require people to register so early? Each season, there are over 1400 kids in our program, 500-600 of which participate in our travel program. It is a great turnout each year. Our travel programs require us to create teams based on skill levels. So we have an A / B / C team etc. To assess a player’s skill, we run a placements process each spring which we use as a critical input to the following fall and spring seasons. We require kids to register early for the Fall so we can plan our Placements process effectively. Again, we are measuring approximately 500 kids soccer skills, which takes a lot of coordination. We would not be able to do this effectively without a good idea of the number of kids signed up for the fall. What happened to Belmont Second Soccer (BSS)? 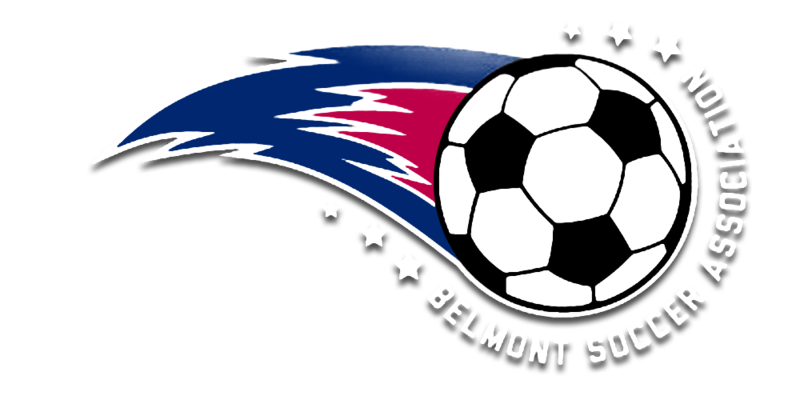 Belmont Second Soccer (K - 2) and Belmont Soccer Association (3 -12) have joined forces to create one soccer organization for Belmont. Belmont Soccer Association will now offer the very popular K - 2 program, and for families this means you will have one consistent experience from K through 12th grade for your child. How do I register for the K-2 League? Registration will now be through the Belmont Soccer Association website (www.belmontsoccer.com). If you already have a child in the 3 - 12 program, you can use your existing login and add your K-2 child to your family profile on that system. If you do not have a child in the 3-12 program, you can easily create an account and add your details and that will it for the rest of your child's playing days in Belmont! Soccer ball size #3. Shin guards are mandatory. Uniforms (team color shirt, shorts, socks) can be purchased at Champions Sporting Goods. Practices are at the discretion of the volunteer coaches and members can expect 1 practice sessions a week. When are the games, where are they played and how long are they? All teams play on Saturdays at Winn-Brook Elementary School fields. Games start at either 8:30am, 9:45am or 11:00am. The games are two 25-minute halves, running time, with a 5-minute halftime break. Prior to each game, the coach divides the team into two squads of equal ability, each with boys and girls. The makeup of each squad varies each week. Playing time should be as even as possible for all players. Games are six versus six – in 1st and 2nd grades one of these players is the goalie – and five versus five for K (no goalie). Could I register my child for travel and then decide to withdraw later? BSA Travel teams participate in the Bay Area Youth Soccer league. This organization determines which teams play in what division and against which other teams. BSA cannot request that we play against other teams or in a division. The administrators at BAYS determine this. As you could imagine, organizing a soccer program across hundreds of teams in dozens of Towns/Cities, takes a lot of preparation and lead time. So for the Fall, BSA needs to commit to a number of teams to BAYS by June 30th and January 31st for the Spring. BSA can only do this based on our registration numbers, therefore when we experience late withdrawals, it can impact the Belmont team, but also the other teams in the league that Belmont are assigned to. If you register your child to play on our travel teams, we really expect that they will play. Please do not register your child if you think there is a risk that you will withdraw them at a later date due to a competing commitment that they prefer. We would ask that you register late if you are unsure about your commitment to the travel soccer program. Why do we hold placement sessions during the week? We moved to a single evening for each age group to allow for a more consistent appraisal across the age group. Previously all age groups were split over 2 weekends. The feedback from the evaluators was that it is very difficult to baseline the skill sets with a 2 week break between the sessions. To improve the evaluation process for your child, we have moved each age group to a single night. There is a choice of 2 sessions that evening. We are confident that all kids in the same age group will be evaluated against the same standard in this new process. If your child cannot attend placement, we will continue to use their previous coaches feedback as an input. But we encourage all kids to attend placements as the data from that is a key determinant in your child’s team for the upcoming seasons. When are the Travel Rosters released? It is our goal to have roster available between July 31st and August 15th each year for Fall soccer. For travel teams, we need to submit our team requests to Boston Area Youth Soccer (BAYS) by July 1st. That is the reason for the July 1st refund deadline. We need real registration numbers in order to submit our team requests. We can’t hold our team formation meeting until we know how many teams we will be fielding. BSA will hold its team formation meetings in early July, and then we typically need two to three weeks to follow up with coaches on some questions from the team formation meetings and to recruit volunteer coaches for some teams that have none (notably boys teams. If you are the parent of a boy, please consider volunteering!). We will look to release provision rosters to coaches and families at the end of July/beginning of August. This is to allow Coaches and families to start scheduling their practices for the Fall. However, every year there are a number of new families who move to town in late August or early September who register after July 1st. As an inclusive program, we attempt to place every child who registers on a team where possible. So we will finalize rosters at the end of August to maximize the child chances of being on a team. Player withdrawals can impact a team, and there are a handful of withdrawals every year during August. Hence the finalized rosters are release in late August, but for those players staying in the program, your info should not have changed. If multiple kids on a team withdraw after we released the provisional rosters, we may need to move players between teams to allow for a certain number of players on the roster.